The RAND Corporation was the ur-think tank, the Cold War granddaddy of them all, and it’s still with us. In the 1950s, nuclear war-gaming a conflagration for which the usual war games would have been ludicrous, it took the U.S. military into virtuality and science fiction long before there was an Internet to play with. (And it had a hand in creating the Internet, too!) In the 1960s, it helped several administrations plan and fight the Vietnam War, making antiseptic theory into an all-too-grim reality. And that’s just the beginning of the work RAND did on a range of hot-button imperial issues. The RAND Corporation of Santa Monica, Calif., was set up immediately after World War II by the U.S. Army Air Corps (soon to become the U.S. Air Force). The Air Force generals who had the idea were trying to perpetuate the wartime relationship that had developed between the scientific and intellectual communities and the American military, as exemplified by the Manhattan Project to develop and build the atomic bomb. Soon enough, however, RAND became a key institutional building block of the Cold War American empire. As the premier think tank for the U.S.’ role as hegemon of the Western world, RAND was instrumental in giving that empire the militaristic cast it retains to this day and in hugely enlarging official demands for atomic bombs, nuclear submarines, intercontinental ballistic missiles, and long-range bombers. Without RAND, our military-industrial complex, as well as our democracy, would look quite different. Abella has nonetheless made a valiant, often revealing and original effort to uncover RAND’s internal struggles  not least of which involved the decision of analyst Daniel Ellsberg, in 1971, to leak the Department of Defense’s top secret history of the Vietnam War, known as The Pentagon Papers to Congress and the press. But Abella’s book is profoundly schizophrenic. On the one hand, the author is breathlessly captivated by RAND’s fast-talking economists, mathematicians, and thinkers-about-the-unthinkable; on the other hand, he agrees with Yale historian John Lewis Gaddis’ assessment in his book, The Cold War: A New History, that, in promoting the interests of the Air Force, RAND concocted an “unnecessary Cold War” that gave the dying Soviet empire an extra 30 years of life. RAND was the brainchild of General H. H. “Hap” Arnold, chief of staff of the Army Air Corps from 1941 until it became the Air Force in 1947, and his chief wartime scientific adviser, the aeronautical engineer Theodore von Kármán. In the beginning, RAND was a freestanding division within the Douglas Aircraft Company which, after 1967, merged with McDonnell Aviation to form the McDonnell-Douglas Aircraft Corporation and, after 1997, was absorbed by Boeing. Its first head was Franklin R. Collbohm, a Douglas engineer and test pilot. Similarly, RAND researchers saw Soviet motives in the blackest, most unnuanced terms, leading them to oppose the détente that President Richard Nixon and his National Security Adviser Henry Kissinger sought and, in the 1980s, vastly to overestimate the Soviet threat. Abella observes, “For a place where thinking the unthinkable was supposed to be the common coin, strangely enough there was virtually no internal RAND debate on the nature of the Soviet Union or on the validity of existing American policies to contain it. RANDites took their cues from the military’s top echelons.” A typical RAND product of those years was Nathan Leites’ The Operational Code of the Politburo (1951), a fairly mechanistic study of Soviet military strategy and doctrine and the organization and operation of the Soviet economy. Collbohm and his colleagues recruited a truly glittering array of intellectuals for RAND, even if skewed toward mathematical economists rather than people with historical knowledge or extensive experience in other countries. Among the notables who worked for the think tank were the economists and mathematicians Kenneth Arrow, a pioneer of game theory; John Forbes Nash, Jr., later the subject of the Hollywood film A Beautiful Mind (01); Herbert Simon, an authority on bureaucratic organization; Paul Samuelson, author of Foundations of Economic Analysis (1947); and Edmund Phelps, a specialist on economic growth. Each one became a Nobel Laureate in economics. the development of the ICBM as a weapon of war” (he invented the multiple independently targetable reentry vehicle, or MIRV); Paul Baran, who, in studying communications systems that could survive a nuclear attack, made major contributions to the development of the Internet and digital circuits; and Charles Hitch, head of RAND’s Economics Division from 1948 to 1961 and president of the University of California from 1967 to 1975. The most notorious of RAND’s writers and theorists were the nuclear war strategists, all of whom were often quoted in newspapers and some of whom were caricatured in Stanley Kubrick’s 1964 film Dr. Strangelove, Or: How I Learned to Stop Worrying and Love the Bomb. (One of them, Herman Kahn, demanded royalties from Kubrick, to which Kubrick responded, “That’s not the way it works, Herman.”) RAND’s group of nuclear war strategists was dominated by Bernard Brodie, one of the earliest analysts of nuclear deterrence and author of Strategy in the Missile Age (1959); Thomas Schelling, a pioneer in the study of strategic bargaining, Nobel Laureate in economics, and author of The Strategy of Conflict (1960); James Schlesinger, secretary of defense from 1973 to 1975, who was fired by President Ford for insubordination; Kahn, author of On Thermonuclear War (1960); and last but not least, Albert Wohlstetter, easily the best known of all RAND researchers. Starting in 1967, I was, for a few years  my records are imprecise on this point  a consultant for RAND (although it did not consult me often) and became personally acquainted with Albert Wohlstetter. In 1967, he and I attended a meeting in New Delhi of the Institute of Strategic Studies to help promote the Nuclear Non-Proliferation Treaty (NPT), which was being opened for signature in 1968, and would be in force from 1970. There, Wohlstetter gave a display of his well-known arrogance by announcing to the delegates that he did not believe India, as a civilization, “deserved an atom bomb.” As I looked at the smoldering faces of Indian scientists and strategists around the room, I knew right then and there that India would join the nuclear club, which it did in 1974. (India remains one of four major nations that have not signed the NPT. The others are North Korea, which ratified the treaty but subsequently withdrew, Israel, and Pakistan. Some 189 nations have signed and ratified it.) My last contact with Wohlstetter was late in his life  he died in 1997 at the age of 83  when he telephoned me to complain that I was too “soft” on the threats of communism and the former Soviet Union. Albert Wohlstetter was born and raised in Manhattan and studied mathematics at the City College of New York and Columbia University. Like many others of that generation, he was very much on the Left and, according to research by Abella, was briefly a member of a Communist splinter group, the League for a Revolutionary Workers Party. He avoided being ruined in later years by Sen. Joseph McCarthy and J. Edgar Hoover’s FBI because, as Daniel Ellsberg told Abella, the evidence had disappeared. In 1934, the leader of the group was moving the Party’s records to new offices and had rented a horse-drawn cart to do so. At a Manhattan intersection, the horse died, and the leader promptly fled the scene, leaving all the records to be picked up and disposed of by the New York City sanitation department. In 1951, there were a total of 32 SAC bases in Europe and Asia, all located close to the borders of the Soviet Union. Wohlstetter’s team discovered that they were, for all intents and purposes, undefended  the bombers parked out in the open, without fortified hangars  and that SAC’s radar defenses could easily be circumvented by low-flying Soviet bombers. RAND calculated that the USSR would need “only” 120 tactical nuclear bombs of 40 kilotons each to destroy up to 85 percent of SAC’s European-based fleet. LeMay, who had long favored a preemptive attack on the Soviet Union, claimed he did not care. He reasoned that the loss of his bombers would only mean that  even in the wake of a devastating nuclear attack  they could be replaced with newer, more modern aircraft. He also believed that the appropriate retaliatory strategy for the United States involved what he called a “Sunday punch,” massive retaliation using all available American nuclear weapons. According to Abella, SAC planners proposed annihilating three-quarters of the population in each of 188 Russian cities. Total casualties would be in excess of 77 million people in the Soviet Union and Eastern Europe alone. In selling these ideas Wohlstetter had to do an end-run around SAC’s LeMay and go directly to the Air Force chief of staff. In late 1952 and 1953, he and his team gave some 92 briefings to high-ranking Air Force officers in Washington, D.C. By October 1953, the Air Force had accepted most of Wohlstetter’s recommendations. A few years later, Wohlstetter wrote an updated version of the basing study and personally briefed Secretary of Defense Charles Wilson on it, with Gen. Thomas D. White, the Air Force chief of staff, and Gen. Nathan Twining, chairman of the Joint Chiefs of Staff, in attendance. Despite these achievements in toning down the official Air Force doctrine of “mutually assured destruction” (MAD), few at RAND were pleased by Wohlstetter’s eminence. Bernard Brodie had always resented his influence and was forever plotting to bring him down. Still, Wohlstetter was popular compared to Herman Kahn. All the nuclear strategists were irritated by Kahn, who ultimately left RAND and created his own think tank, the Hudson Institute, with a million-dollar grant from the Rockefeller Foundation. Wohlstetter went on to accept an appointment as a tenured professor of political science at the University of Chicago. From this secure position, he launched vitriolic campaigns against whatever administration was in office “for its obsession with Vietnam at the expense of the current Soviet threat.” He, in turn, continued to vastly overstate the threat of Soviet power and enthusiastically backed every movement that came along calling for stepped up war preparations against the USSR  from members of the Committee on the Present Danger between 1972 to 1981 to the neoconservatives in the 1990s and 2000s. Wohlstetter’s activism on behalf of American imperialism and militarism lasted well into the 1990s. According to Abella, the rise to prominence of Ahmed Chalabi  the Iraqi exile and endless source of false intelligence to the Pentagon  “in Washington circles came about at the instigation of Albert Wohlstetter, who met Chalabi in Paul Wolfowitz’s office.” (In the incestuous world of the neocons, Wolfowitz had been Wohlstetter’s student at the University of Chicago.) In short, it is not accidental that the American Enterprise Institute, the current chief institutional manifestation of neoconservative thought in Washington, named its auditorium the Wohlstetter Conference Center. Albert Wohlstetter’s legacy is, to say the least, ambiguous. Needless to say, there is much more to RAND’s work than the strategic thought of Albert Wohlstetter, and Abella’s book is an introduction to the broad range of ideas RAND has espoused  from “rational choice theory” (explaining all human behavior in terms of self-interest) to the systematic execution of Vietnamese in the CIA’s Phoenix Program during the Vietnam War. 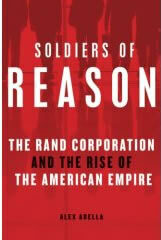 As an institution, the RAND Corporation remains one of the most potent and complex purveyors of American imperialism. A full assessment of its influence, both positive and sinister, must await the elimination of the secrecy surrounding its activities and further historical and biographical analysis of the many people who worked there. In Vietnam, RAND invented the theories that led two administrations to military escalation against North Vietnam  and even after the think tank’s strategy had obviously failed and the secretary of defense had disowned it, RAND never publicly acknowledged that it had been wrong. Abella comments, “RAND found itself bound by the power of the purse wielded by its patron, whether it be the Air Force or the Office of the Secretary of Defense.” And it has always relied on classifying its research to protect itself, even when no military secrets were involved. In my opinion, these issues come to a head over one of RAND’s most unusual initiatives  its creation of an in-house, fully accredited graduate school of public policy that offers Ph.D. degrees to American and foreign students. Founded in 1970 as the RAND Graduate Institute and today known as the Frederick S. Pardee RAND Graduate School (PRGS), it had, by January 2006, awarded over 180 Ph.D.s in microeconomics, statistics, and econometrics, social and behavioral sciences, and operations research. Its faculty numbers 54 professors drawn principally from the staffs of RAND’s research units, and it has an annual student body of approximately 900. In addition to coursework, qualifying examinations, and a dissertation, PRGS students are required to spend 400 days working on RAND projects. How RAND and the Air Force can classify the research projects of foreign and American interns is unclear; nor does it seem appropriate for an open university to allow dissertation research, which will ultimately be available to the general public, to be done in the hothouse atmosphere of a secret strategic institute. Abella reports that Charles Wolf Jr. the chairman of RAND’s Economics Department from 1967 to 1982 and the first dean of the RAND Graduate School from 1970 to 1997, “dripped venom when interviewed about the [Ellsberg] incident more than thirty years after the fact.” Such behavior suggests that secrecy and toeing the line are far more important at RAND than independent intellectual inquiry and that the products of its research should be viewed with great skepticism and care.